What if your work pass expires on the next six months, do you have any other plan how to earn money on an extra or a full time job? In Singapore, Overseas Foreign Workers (OFWs) are issued with a work pass, a permit to work. Usually, work pass are valid for 1 year, 2 years, or even 3 years as decided by the Ministry of Manpower (MOM), a government body that handles workforce issues in Singapore. The pass is renewable at the end of the validity. This year, 2013, MOM had not renewed some workers in the Singapore workforce. This is their measure to cut down a percentage of foreign workers to give way for their local workforce. My friend, who worked in an internet service provider company, told me that 8 of their Filipino colleagues were sent back home because their pass were not renewed. She remembered bringing their colleague and a long-time friend to the airport with tears as they hug them goodbye. This scene is what foreign workers are scared to experience. What if there are still debts left to pay and mouths to feed? I learned a lot on these sad stories. We can't blame anyone because this is the reality that we need to face. In my spare time, I did some research to find out how to have a fallback once I will be sent home for good. This video taught me a lesson on how to save money while we are earning in Singapore. Saving money for the coming rain can help us feel confident if ever we are going back home. If we are unlucky with the outcome of our stay here in Singapore, there is one thing that I can share to you that you might be interested. There is nothing better than working your 8 hours at home with your family. This is the best job that everyone wants to have. If you had followed the lessons from the video, you are now ready to invest a bit of your savings to set up your home-based job, or should I call it a business? There are a lot of business ideas, such as franchising, buying and selling of goods or doing the business that you are an expert in. But, before you start your own business, you got to have someone to guide you on your business plan. 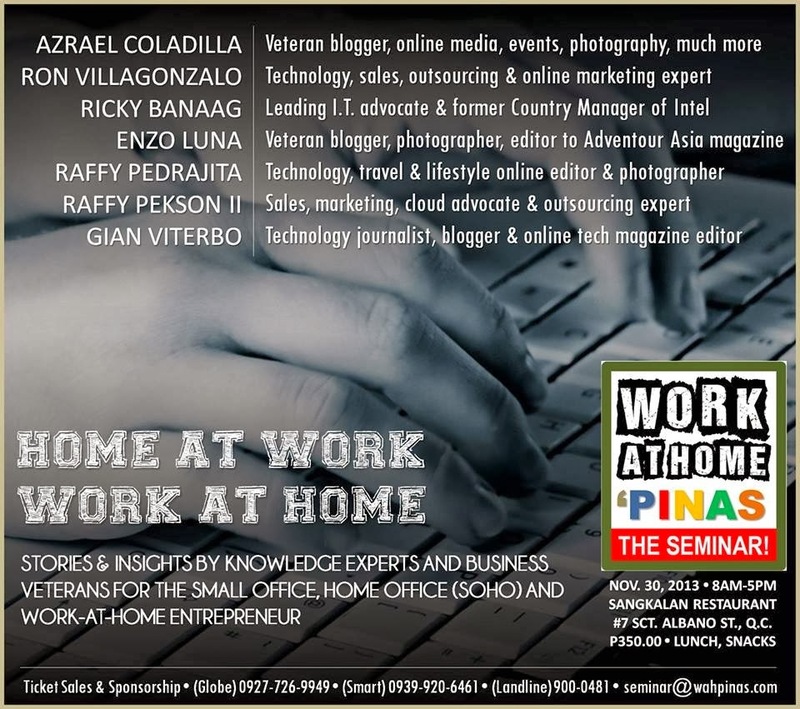 NOTE: The Seminar shown below was already conducted at that same date. If you want to learn more about this topic or inquire for their next seminar, please contact WAHPINAS. If you are available on November 30, 2013 and planning to have a home-based job or a business, you may consider attending the seminar that was organized by my friends. Each speaker has his own expertise, from photography to outsourcing. Be able to learn from the EXPERTS, get their knowledge and apply it to your advantage.